LOUISVILLE, Colo. -- Sierra Nevada Corporation (SNC) Space Systems successfully completed a "captive carry test" of its full-scale Dream Chaser orbital crew vehicle Tuesday, marking a new milestone in the company's effort to develop transportation for astronauts to low Earth orbit and the International Space Station. 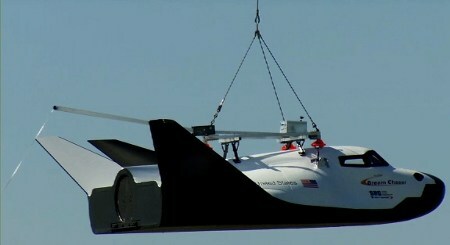 During the test, the Dream Chaser flight vehicle was carried under an Erickson Air-Crane helicopter to assess the vehicle's aerodynamic flight performance, which will allow additional flight tests in the future. The helicopter flew for approximately an hour near the Rocky Mountain Metropolitan Airport in Jefferson County, Colo.
SNC is one of several companies working to develop commercial crew transportation capabilities under the Commercial Crew Development Round 2 (CCDev2) agreement with NASA's Commercial Crew Program (CCP), which is helping spur innovation and development of new spacecraft and launch vehicles from the commercial industry. "This is a very positive success for the Dream Chaser team and their innovative approach," NASA CCP Program Manager Ed Mango said. "I applaud and encourage the designers and engineers to continue their efforts in meeting the objectives of the rest of their CCDev2 milestones." The Dream Chaser is designed to carry as many as seven astronauts to space. It is the only spacecraft under CCDev2 that is winged and designed to land on a conventional runway. Data from the test will provide SNC an early opportunity to evaluate and prove hardware, facilities and ground operations in preparation for approach and landing tests scheduled for later this year. Additional milestones leading up to the test included evaluating the performance of the main landing gear selected for use on the Dream Chaser flight vehicle, an interface test to demonstrate the release mechanism between the spacecraft prototype and the heavy-lift helicopter, and a thorough flight test readiness review with engineers, technical experts and representatives from SNC and NASA. Another milestone evaluated the separation system compatibility of Dream Chaser with its initial launch vehicle, the United Launch Alliance Atlas V rocket, which would be used to release the spacecraft from the rocket's second stage after it has placed the spacecraft into low Earth orbit. All of NASA's industry partners, including SNC, continue to meet their established milestones in developing commercial crew transportation capabilities. Earlier this month in Cocoa Beach, Florida, Sierra Nevada Corporation Space Systems announced its interest in Florida's Space Coast as a possible location for commercial human spaceflight programs and facilities. Sierra Nevada is in development with plans to launch on the United Launch Alliance Atlas V vehicle from Launch Complex-41 at Cape Canaveral Air Force Station in Florida.